I know my response should be wonder, awe and amazement. But is my response bored familiarity? After all, haven’t I been learning about Him since I was a child? I can recite the 23rd Psalm and many Bible stories. My grandparents, aunts, uncles and parents all know Him. My hope is that none of us respond to God with bored familiarity. Even after years of knowing Him and calling Him my Father, I am still learning about His vastness, His ever-presence, His majesty, His grace, His creativity, and much more. The easiest way I’ve found to behold our God is to look at the beautiful creation around us. Each day He gives us a sunrise and a sunet. We are surrounded by gently rolling hills and two grand mountains. Our desert valley is packed full of agricultural and cultural variety. As you witness God’s splendor, majesty, creativity and grace today, behold Him! And then boast about Him. Very well said. 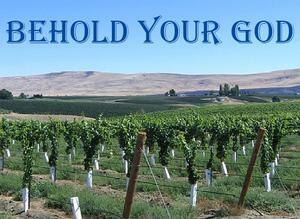 We are blessed in the Yakima Valley! Thanks for the reminder. Hello to all of you out in the blogosphere! My name is Henry Bosma and I have the honor and privilege to serve as school board president for the 2014/2015 school year. It is an honor because Sunnyside Christian is a wonderful, God-centered institution that has touched the lives of hundreds of kids over decades of furthering our Lord’s kingdom. It is a privilege because as a parent of three kids at SCS I get to interact with the teachers and staff, all of whom are fantastic at their jobs and come to work each school day with one thing in mind…execute our school’s mission, which is to provide a Christ-centered, Bible-based education in which the quality of teaching reflects a commitment to Christ. I can tell you from personal experience, they go above and beyond that mission! Another part of the mission is to assist in developing the whole child: spiritually, academically, socially & physically. The curriculum is top-notch, and standards for education are high, as the students are challenged to accept Jesus Christ as Savior, develop a Christ-like character, and work to their fullest potential in all they do. I have had nine nieces and nephews graduate from SCS. From that group there are two nurses, four business degrees, a niece in a nursing program as well as one in a business program, and a nephew studying medical physics. They all credit their years at SCS for laying out the foundation of their education, study habits, and equipping them to fulfill their responsibilities to God and His world. On a personal note, my oldest child has Asperger’s Syndrome, which is a form of autism. When my wife and I received this diagnosis, the first questions from the school were “how can we help and what do we need to do?” That was a very comforting feeling. What has happened over the past few years is that the awesome teachers at SCS, with a combined 125+ years of teaching experience, adapted to my son’s unique gifts (and challenges) so that his day-by-day educational experience is the best that it can be. I can’t think of a better place for us to send our kids to school! Well said Henry, you will do an awesome job in the year to come. God's blessing and you will be in my prayers. 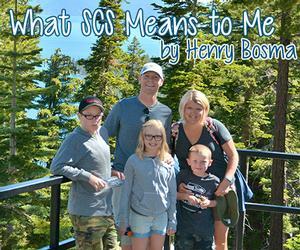 Beautiful blog, Henry! You will do a great job of leading SCS! Love you!